I love pizza. It is probably one of my favorite foods that I could eat daily. We have pizza around here at least once a week. My favorite crust mix is one made by Namaste Foods. They have the best pizza crust mix and pancake/waffle mix that I have found. If I’m in a hurry my favorite go to frozen pizza is Freschetta Gluten Free frozen pizza. My family is a pepperoni pizza kind of people. That’s all they want. Me, I like to try different ways of making pizza. 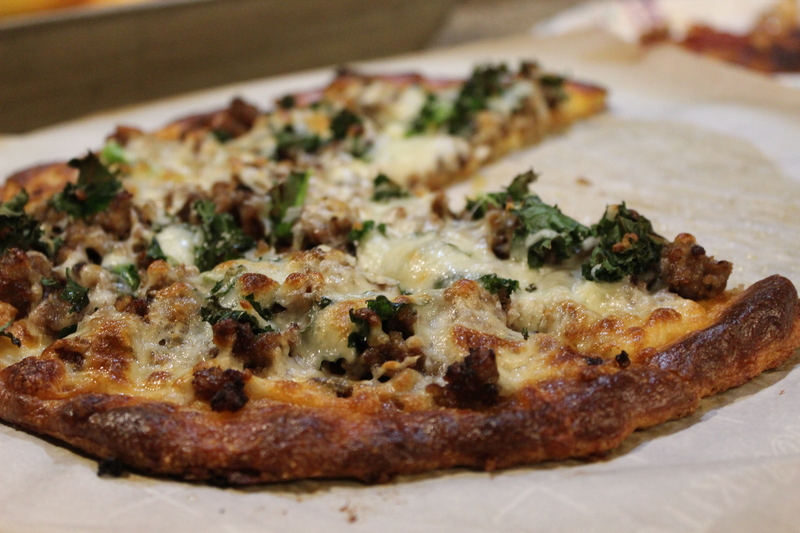 So the other night I made them a frozen pizza (everyone was hungry and it was late) and I made myself some fat head dough and decide that sausage and kale sounded really good. Low carb dieting seems to be in for 2018. The most popular low carb diet currently on the market, per say, is the Ketogeneic/Keto Diet. I am sure you all have heard of it by now. Many of my friends are following the low carb/low sugar diet. I myself do follow this and really watch my carb and sugar intake. I have been doing this since last April and have personally lost about 20 pounds. I can maintain this loss and still eat what I want at this time. This includes eating gluten-free spaghetti and pastas, along with crackers. The key is, everything in moderation. I know that if I eat pasta one day than the next day I should probably not have very many carbs. I use to track my carb and sugar intake daily, but not so much any more. I eat around 20-40 grams of carbs a day. When I was dropping weight like crazy, I kept sugars and carbs to under 20 grams a day. I believe that it is important to pay attention to what we are eating. As a psychologist, I understand that everything we put in our bodies reacts chemically with the chemicals that are in our body. Food can play a huge role in how we feel and act, this is all due to alternating the chemicals in our body with food. Eating a low carb/low sugar diet you will find that you sleep better, your mood is more positive, you have more energy, your body may not have as many aches and pains as before. This is all due to chemicals in our food that react with the chemicals in our bodies. I could go on and on with a topic like this, but I won’t bore you! You all get the picture!